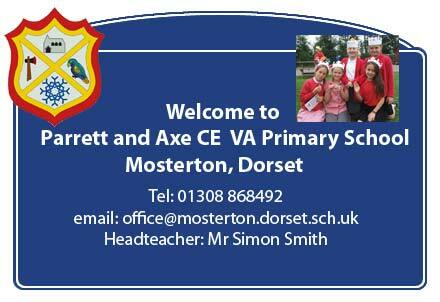 On behalf of the children and staff, I would like to welcome you to Parrett and Axe CE VA Primary School. Parrett and Axe is a wonderful school set in the heart picturesque West Dorset just over the Somerset border near Crewkerne and Beaminster. Christian values are at the heart of everything we do and at the centre of our learning. In January 2018 we welcomed Mosterton Pre School onto our site which will further our links and ensure that children receive an excellent start to their education. We are very proud that visitors to our school comment positively on the high-quality teaching and learning, caring ethos and outstanding behaviour that they observe. It is the school’s priority to provide a stimulating environment where children grow and develop in safe and supportive surroundings and become equipped with skills for life-long learning. Children at Parrett and Axe are recognised as unique individuals, with specific talents and needs. Children grow and develop in safe and supportive surroundings and become equipped with skills for life-long learning. Children at Parrett and Axe are recognised as unique individuals, with specific talents and needs. As a village school, we also aim to work in close partnership with parents and the local community. We welcome many visitors into school to support and enhance the children’s learning and you will regularly see us out and about in the locality, making full use of the stimulating environment and encouraging pupils to develop their citizenship. Thank you for browsing our website. If you would like to know more about the school, you are very welcome to contact the School Office or to come and visit us. The children of Parrett and Axe very much enjoy talking about and sharing their achievements and learning and we will all look forward to meeting you.